Our living room wall is covered in this fabulous black textured wallpaper and it's just dying for a beautiful piece of art. Tim and I had been wanting to get something great but just haven't been able to find the right canvas. The search is still on, but in the meantime, I figured I'd try my hand at a super easy DIY craft. I love www.curbly.com for crafty DIY inspiration. They have makeovers, arts and crafts, even "Foodie Fridays" and they're designs couldn't be easier. I saw a neat art project that I thought would be great for our wall; it didn't quite turn out they way I wanted but it's perfect in our office. Curbly led me to another easy DIY art project with how-to's and recommendations here and here. They made it look so darn easy, that I bought a couple canvas and had at 'er. This one, I was impressed with. This one went up on the wall. 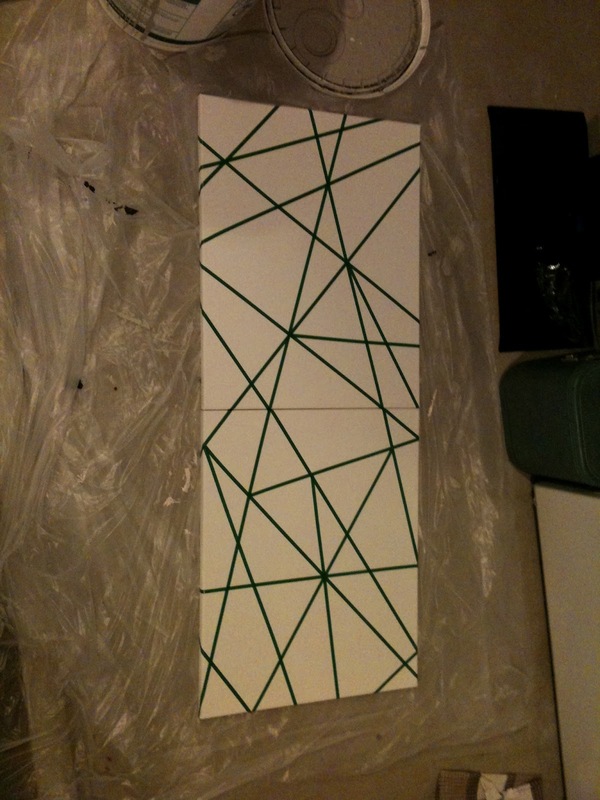 I taped off the two canvas in a pattern that flowed together but would be hung apart. I made the mistake of using tape that was intended for florists' use and resembled duct tape. Unfortunately it wasn't the best decision I made, but I guess I know better for next time. As you can see, some of the lines weren't entirely crisp when I pulled with tape off but I just touched them up with white acrylic. A secret to this project was, I didn't use acrylic paint for the entire canvas. Instead, I used three different colors that would tie things together with the purple lamps and foot stools in our living room. Our other walls are grey, so I used some of that remaining paint. Then, because I love Lowe's, I picked up a few free samples of Valspar paint in varying tones of purple. The finished product isn't perfect, but considering it didn't cost much and I had fun doing it... I'm pretty happy with the result. Plus, now I know what to do for the next time! 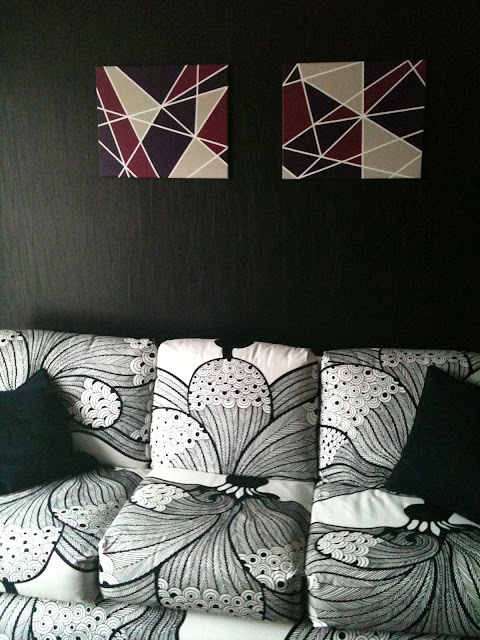 I think it would be fun to mimic the pattern of the couch and tape off softer lines next time. It's as easy as painting over the canvas and giving it another go. But first, a canvas for Gracie's room!